Boring machine in the daily production of more common hole processing Technology _ news _ Xinxiang Blueprint Machinery Co., Ltd. Processing industry is an essential part in the process of social production. With the continuous development of living standards, people on the various aspects of product requirements are also beginning to become more stringent, so a rigorous and efficient processing process can make products more popular. Hole machining is a kind of processing technology commonly used in industry, it is more convenient for people to use in the life after punching the product. 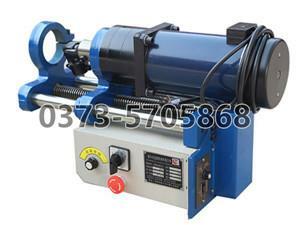 Today let boring machine manufacturers of technical staff to introduce you to the next hole processing technology. Hole processing is mainly in the machine tool using a variety of tools for the hole processing products, usually divided into drilling, reaming, boring, reaming, broaching and so on. The drilling is a hole roughing method, usually used for 0.05-100mm hole machining, hole size accuracy in IT10 and lower, surface roughness in the ra12.5μm around. Drilling due to the low precision, often as the pre-processing of boring. Bore size accuracy can reach IT7, the surface roughness can be controlled in ra12.5-0.8μm, so it is often used for different diameters of coarse, semi-fine and finishing. Although the reaming process is more fine than drilling, its dimensional accuracy is only about IT10, the surface roughness is ra12.5-6.3μm, in order to make more fine holes, it is also often the pre-processing of reaming technology. Reaming is a kind of hole finishing technology, the dimensional accuracy is more it9-6, the surface roughness can be controlled between ra3.2-0.2μm. Drawing hole has high precision and production efficiency, dimensional accuracy in it9-7, surface roughness can be controlled to ra1.6-0.8μm, but because of the higher cost of the tool, it is more suitable for large-scale production, rather than single processing. But boring machine manufacturers remind you, no matter what method, general welding is only for the system to make the hole in line with the needs of people, choose the right method for your products, can play a greater role in the potential of the product.